Discover the fun of cycling the Clare Valley Riesling Trail with Wine Selectors Membership Consultant, Elliot Watt, as he shares all his tips for touring through this spectacular wine region. Exercise and wine don’t usually go together, but, when you think about it, it's actually a genius combination. You are essentially cancelling out the damage done by one with the other. Well, in theory, anyway. Now a word of warning. We’re in no way suggesting you empty a bottle of wine into your drink bottle and hit the gym. There are far more attractive and much more appropriate places to achieve this symbiotic activity. A leisurely two-hour drive north of Adelaide will see you in Australia’s epicentre for Riesling, the Clare Valley, where you’ll find the Riesling Trail. This 35-kilometre-long cycling and walking track follows the path of the old rail line that sliced through the hills before it was irreparably damaged by the 1983 Ash Wednesday Bushfires. Today, the trail takes you past some of the region’s finest Riesling producers, so get ready to sip, sweat and cycle your way through the Clare Valley. 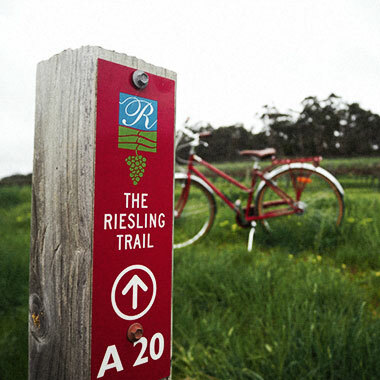 It all begins with a visit to the Riesling Trail Bike Hire to collect your trusty steed. Kent will size you up with the perfect bike and give you the local lowdown on the trail. Once in the saddle, an easy 12-minute ride north on the trail will take you to your first destination, Knappstein Enterprises Winery and Brewery. Originally established as the Enterprises Brewery in 1878, the current winery was installed by Clare Valley icon Tim Knappstein in the late 1960s. In 2006, 89 years after the original taps went dry, the brewing of beer started up once again in this heritage building. For Riesling lovers, definitely look to the Single Vineyard range, which is a perfect expression of the diversity in Clare Riesling. However, if you prefer a beer, then the delicious Knappstein Reserve Larger will quench your thirst and replenish the tank for the next leg of the journey. Now you need to put in some hard yards and work off that wine and/or beer. Head south, 6km from Clare, and you’ll arrive in Sevenhill where it’s time to take a detour. John Horrocks Road is off the trail and runs through some seriously beautiful countryside, which will take your mind off the fact your legs are on fire. 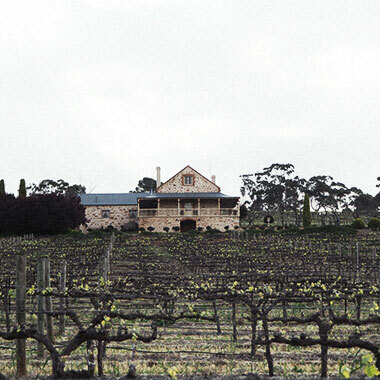 More importantly, it leads you to one of the jewels of the Clare Valley, Mitchell Wines. Andrew and Jane Mitchell established their winery in 1975 and have created something really special, showcasing a true Australian family-owned and run winery. On arrival, Jane welcomes you like you’re one of the family and you can tell her and Andrew are proud of their wines and vineyards and so they should be. Within their quaint cellar door, they present stunning single vineyard Rieslings, as well as Shiraz, Cabernet Sauvignon and Semillon. Now, it’s awfully hard to transport wine on a bike, trust me, I ride to work at Wine Selectors and constantly attempt to juggle wines home. However, not to worry, Jane will personally deliver any purchases direct to your accommodation that very same day. Departing Mitchell Wines, with a few more turns of the cog, you’ll be off the detour and back on the trail. This is where things start to go downhill, literally, not figuratively, as you’re now over the incline and can give the legs a rest as you glide through the rolling hills towards Watervale. As soon as you arrive, it’s essential to restore your energy with some carb loading and there’s no better place to do so than the Watervale General Store. It’s one of those charming country icons that is part café, part grocery store, part post office. The food is simple and delicious, but heed my warning, it's not wise to consume a full pizza and then carry on the trail as if you are riding in Le Tour De France. That pizza will come back to haunt you. With a full stomach and renewed energy, it shouldn’t take long to reach the next town of Leasingham and the home of Claymore Wines. Here you can wash down lunch with a glass of Dark Side of The Moon or Bittersweet Symphony. No idea what I’m talking about? Cleverly, the majority of their wines are labelled after hit songs from a bygone era. However, there are no gimmicks when it comes to the wines with some seriously good juice going on here. Sing your way through the range, find your favourite and sit down with a glass accompanied by a board of local South Australian Cheese. For a second in time, you will completely forget about your aching muscles and the fact you still have to ride home. The Riesling Trail comes to an end a further five clicks south at the town of Auburn. Unfortunately, I cannot tell the tale of Auburn as Leasingham is as far as my legs would carry me. Some say, namely my wife, it was the pizza that lead to my ultimate demise however that’s neither here nor there. Now begins the journey home, although it's not over yet. As any good bicycle wine tour strategist knows, you’re going to get thirsty, so Stone Bridge in Sevenhill is the perfect rehydration stop. Crafting not only exceptional Riesling but another 14 wines from 7 different grape varieties, Stone Bridge has something to quench any thirst. Once off the bike if you stop moving things begin to hurt, the wine wears off and the lactic acid sets in. The only solution is to manoeuvre yourself directly to Seed Winehouse and Kitchen in Clare. Immersed in the simplistic stone and natural timber of the old chaff mill, you begin to imagine you are somewhere in rural Italy about to dine on local rustic cuisine. However, Head Chef Guy Parkinson is no Nonna, he may be better. Offering sophisticated A la Carte and degustation options, the menu highlights local produce with a wine list to reflect. Nearly 200 local and international wines will make the decision hard, add in 47 Gin choices and the mind begins to boggle. Whatever your decision there is no doubt any indulgence is guilt free. You have literally burned off three Big Macs during the ride so sit back, reward yourself and reflect on the beauty of the Clare Valley and the amazing wines it has to offer. We recently caught up with Ross Brown from the iconic Brown Brothers to talk Prosecco and Christmas. Your Brown Brothers Vintage Release Single Vineyard Prosecco 2014 is our Wine of the Month for December – what makes it so special for this time of the year (or anytime really)? Sparkling wine is all about celebration with friends and Prosecco is the new exciting fashion for Sparkling. It’s fine, zesty, dry and refreshing and just perfect for those lazy summer days. Brown Brothers has over 126 years of history in Australian winemaking and family is obviously very important to you. How is your family planning on spending this Christmas? Having all the immediate family around the Christmas dinner table is mandatory, but just a bit more complex this year, as Emma our youngest daughter is living in Napa Valley, California. We have all made a commitment to be in Mammoth Mountain, a ski town for Christmas. We will go by the local market and buy oysters and salmon for entree and duck for mains. My wife Judy's confit of duck recipe is a family legend. What wines will your family be enjoying over Christmas? This year as Emma is hosting, she's sourcing the wines with the brief to surprise us with the best of California, especially Pinot for the duck. Can you remember the first wine you ever tried? No, not really. There was always wine on the dinner table, and I was always allowed to taste, as long as I described the taste and aroma. It was no big deal as wine and food was a natural. When did you fall in love with wine? Growing up in the 1960s drinking wine socially was a risky business – real men drank beer! In the 1970s wine became fashionable and I had lots of friends curious about what wine I had brought to the party. I guess that was when I fell in love but not only with the wine. It’s a tough question, but do you have a favourite wine or varietal? When I'm asked which is my favourite wine, my reply invariably is the "next one". In truth Riesling is my favourite white varietal – the flavour dimensions are remarkable with lean and minerally Tasmanian styles through to rich, ripe and generous Noble Riesling. With reds I'm fascinated with Pinot Noir. For me it’s about the silken texture – fine and powerful and so reflective of the vineyard. It matches so many different foods and I'm already thinking about that duck for Christmas. What is your favourite wine memory? This is an impossible question as my entire life has been wine. I have been just so fortunate to grow up in a thriving family business, based in beautiful North East Victoria, and to share a wine and food lifestyle with so many wonderful people. Having dinner with friends and finding that gem that has remained hidden in the cellar for far too long, and it opens fabulously, along with a flood of memories around the year the wine was made, is the ultimate Saturday night filled with lots of laughs and short memories! How do you spend your time when you’re not making wine? With my daughter Katherine now winemaking, I'm delighted to run away and admire her good work, especially knowing she has the best mentors in the world. Judy and I love the ‘hunting and gathering’ lifestyle, we are crazy about fishing and love Tasmania. There we can catch crayfish, calamari, and flat head or fly fish for trout all in one day, and if it's a really tough day, fit in a game of golf just for the frustration. For me seeing another generation, my three daughters, excited and totally engaged in the wine business is the greatest reward, especially if they find a great Riesling and Pinot for Christmas dinner and don't forget the Prosecco! What is your choice at Christmas: Carols by Candlelight – love them or loathe them? A must on Christmas Eve. Sparkling Shiraz, Champagne or both? Prosecco is the new Champagne. Plum pudding, pavlova or trifle? Depends on the age of the Noble Riesling. Turkey, glazed ham or seafood? Seafood, seafood and more seafood. Christmas lunch or dinner? Don't know the difference as it starts around 11am and goes on and on.... Boxing Day recovery? This calls for exercise and this year given a white Christmas, we will all be skiing probably until lunch. This charming cellar door is the perfect place to spend the afternoon sampling a host of award-winning single vineyard Chardonnay, Pinot Noir and Pinot Gris. Enjoy stunning views over the vineyard and a light lunch on the verandah, or perch yourself at the slick tasting bar and be guided by the always friendly cellar door staff through offerings from their Yabby Lake and Red Claw labels. 86-112 Tuerong Rd, Tuerong, VIC - View on our Mornington map Open Daily 10am to 5pm Visit the Yabby Lake website Mornington Peninsular Cellar Door Map Planning a trip to Mornington Peninsula? Download our interactive Mornington Peninsula winery map. To save on your browser or device, click here For more information on visiting the Mornington Peninsula, be sure to visit the official Mornington Peninsula Website or stop by the visitor information centre in Dromana. If you'd like to sample some of the wineries listed in this guide before you visit, explore our selection of Mornington Wines and find out more about the wineries listed here in our Meet the Makers section . And, with the Wine Selectors Regional Release program me, you'll experience a different wine region each Release with all wines expertly selected by our Tasting Panel, plus you'll receive comprehensive tasting notes and fascinating insights into each region. Visit our Regular Deliveries page to find out more!